Watery eyes. Itchy, runny or stuffed nose. Sore throat. These are just some symptoms of allergies. When a foreign object gets into the body, such as pollen from flowers, the body may react by producing antibodies to attack, and antibodies create histamines, and histamines cause the inside of your nose to swell, which produces allergy symptoms. It’s a case of one thing leads to another, but this is the body doing its job to protect against invaders. Broccoli – A member of the crucifer family, broccoli is rich in vitamin C. One cup of broccoli offers about 80 mg of vitamin C.
Garlic and Onions – These two foods contain large amounts of quercetin. 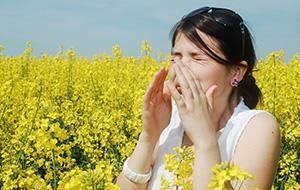 Research has shown that quercetin may be helpful in preventing immune cells from releasing histamines. Grapefruit, Lemons, Limes and Oranges – Citrus is a great source of vitamin C. One large grapefruit offers about 120 mg of vitamin C! Parsley – This popular herb may also reduce the release of histamine in the body.